(L to R) Deputy Mike Ruiz and Lancaster Community Service Officers Sather and Coleman. VENTURA – This past Saturday (Nov. 10), USMC Weapons Company 2nd Bn/ 23rd Marines hosted a formal ball in honor of the 237th birthday of the United States Marine Corps. The ball, which was held in Ventura, was organized by Lancaster Station’s Deputy Mike Ruiz (1st Sgt. USMCR). In preparation for the ball, Ruiz was required to select a Guest of Honor for the event. After extensive research, Ruiz selected Lancaster City Community Service Officer, Charles (Chuck) Sather, who is assigned to Lancaster Station. Chuck served in the U.S. Marine Corps from 1966 to 1970 as an artilleryman. His service included two combat tours in Vietnam. Among his many awards, he was decorated with two purple hearts for injuries he sustained in 1968, while defending firebase “Torch” near the city of Khesanh, which was under attack by North Vietnam Forces. Chuck was injured by small arms fire and an explosion from a “satchel charge.” After a few weeks of recovery, he returned to the battlefield with his unit. 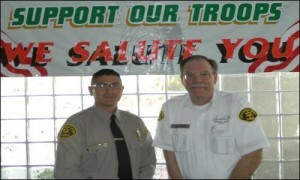 Deputy Ruiz and Officer Sather at Lancaster Station. In March of 1969, Chuck left Vietnam and was stationed at Twenty Nine Palms Ca. In June of 1970, Chuck was honorably discharged and transferred to inactive reserve status at the rank of Sergeant – or so he thought. Deputy Ruiz said that during the process of selecting the Guest of Honor, it was discovered that on May 1, 1972 (while still on inactive reserve status), Chuck was promoted to the rank of a Staff Sergeant. For the past 40 years, Chuck believed he had left the Marine Corps as a Sergeant. 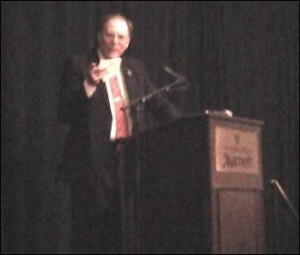 Sather speaks at the ball. 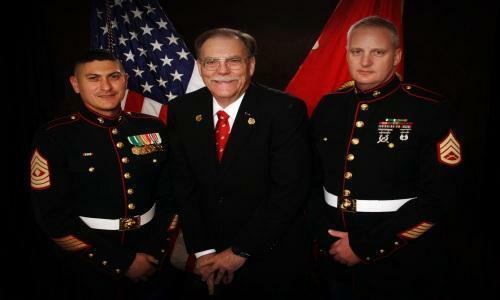 In true fashion of the Marines taking care of a Marine, before he was introduced as the Guest of Honor, and in front of his daughter Danielle, son-in-law Brian and a room full of 250 Marines and honorary guests, Sergeant Chuck Sather was formally promoted to Staff Sergeant. It was a very moving event followed by an equally inspirational and motivational speech by Chuck. 1 comment for "Local veteran receives promotion 40 years later"
Happy birthday, USMC, and congratulations to SSgt. Sather!